Humans have used tools as far back as we archaeologists can track. In fact, our use of tools is what has allowed us as a species to dominate, to overcome what would otherwise seem like insurmountable obstacles—good luck living in the Arctic without tools. Given this, any poker player who is serious about turning a profit will use whatever tools they legally can to increase their edge against the competition. The first tool most players add to their toolbox is some kind of heads up display. Playing without a HUD puts you at such a serious information disadvantage that it’s unreasonably difficult to turn a consistent profit. That’s not to say you won’t stack players from time to time, but over the long term, your game will suffer. Two other web-based poker tools that can improve your game is 888 Poker’s “Poker Calculator” and PokerWarmUp’s Poker Session Timer. Understanding your odds of winning a hand is the difference between seeing your EV line march way up into the black and watching it dip deep into the red. Of course, that doesn’t mean profits in any given situation will follow—if someone has a 4.3% chance of beating you in a situation, it will happen, eventually. However, serious poker players know that as long as they keep making +EV decisions, they’ll be able to grind it out and turn a profit. 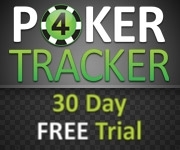 The Poker Calculator allows you to determine your exact odds for any given situation. You can calculate the odds in heads-up, six-max, or a full table game. All you have to do is plug in your hand, your opponents’ hands, and the board. With this information, you can start deciding what moves are going to be +EV for you. If there’s information you don’t have, you can leave your opponents cards blank, and you’ll be given your odds of winning based on a random holding. For example, if you want to know how A of hearts and A of spades stacks up against ten random hands, plug in your aces to find out you have a 30.5% chance of winning ahead of the flop—everyone else sitting with two random cards has 6.9%. Of course, if everyone sticks around for the flop and it comes out nasty—let’s say all diamonds—then the calculator will tell you that you have only a 13.7% chance of winning. If you want to see how a heads-up situation looks on that flop against one random diamond, fold out the rest of the players and give the one remaining player a hand with a diamond—you’re still going to have a 62% chance of scooping the pot. The best part about the calculator is that it’s simple to use. The math is all behind the scenes, and the interface is clean and simple without limiting your abilities to really test out situations. The poker calculator is ideal for reviewing hands to ensure you made the right choice—or to prove to friends that you made the right choice based on the odds. It can also be used in play if you’re really unsure of what to do, but are able to give your opponent a very narrow range. As always, may the odds always be in your favor—and may you always know them. You might have strong reads, top skills at determining ranges and be good at calculating your odds of winning a hand on the spot. 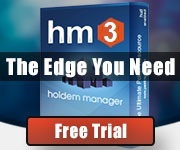 However, poor game-time management skills can still cost you a fortune and dull your edge in a cash game. It’s way too easy to get on the grind and dig in until your screen is blurry and your bladder is about to burst—we’ve all been there. For some, it’s hard to step away for a breather when you’re crushing. For others, it’s hard to take a break when you’re on a nasty downswing. And for nearly everybody, it’s easy to lose track of time and put in long, break-less sessions without even realizing it. PokerWarmUp’s Session Timer tool is the cure. Pull up the site, set the amount of time you want until your first break and then start the countdown. In general, you’re going to get the best results by taking at least a 10-minute break every 1.5-2 hours. It’s a strategy used by anyone engaged in “think-work” that is shooting for optimizing their time and effort. Short breaks are known to restore motivation, help with decision fatigue, increase creativity, and improve learning. Additionally, for poker players, it can help you manage your tilt tendencies. Of course, the clock, which will also play relaxing background music if you want it to, is only a reminder to take a break. If you find yourself cursing at your computer, tired, or hungry—it’s time to take a break. When you take breaks, make them “moving breaks.” Don’t just click over to Facebook for 10 minutes. Get up and go for a walk, do some yoga stretches, or even a few push-ups—just get your body moving. Drinking water and gnawing on some healthy snacks are also a good idea during your break. You want to stay properly fueled and hydrated during your sessions. 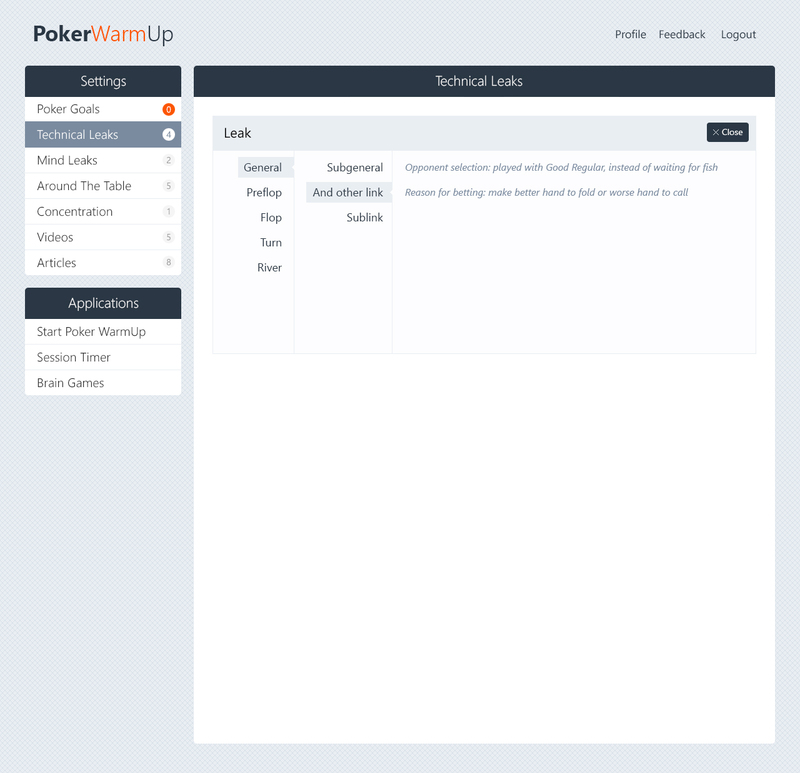 By setting your timer as part of your pre-session warmup routine—which you can do when you create a free account on pokerwarmup.com—you can opt to review what leaks you have in your game and make a mental note to focus on those specific issues in your upcoming session. Along the same lines, when the timer goes off and you’re ready to call it a session—rather than just taking a break—you can spend a few minutes going through a cooldown routine. Doing this will allow you to process what you’ve learned from the session and identify any mistakes or areas you’d like to see yourself improve on next session. 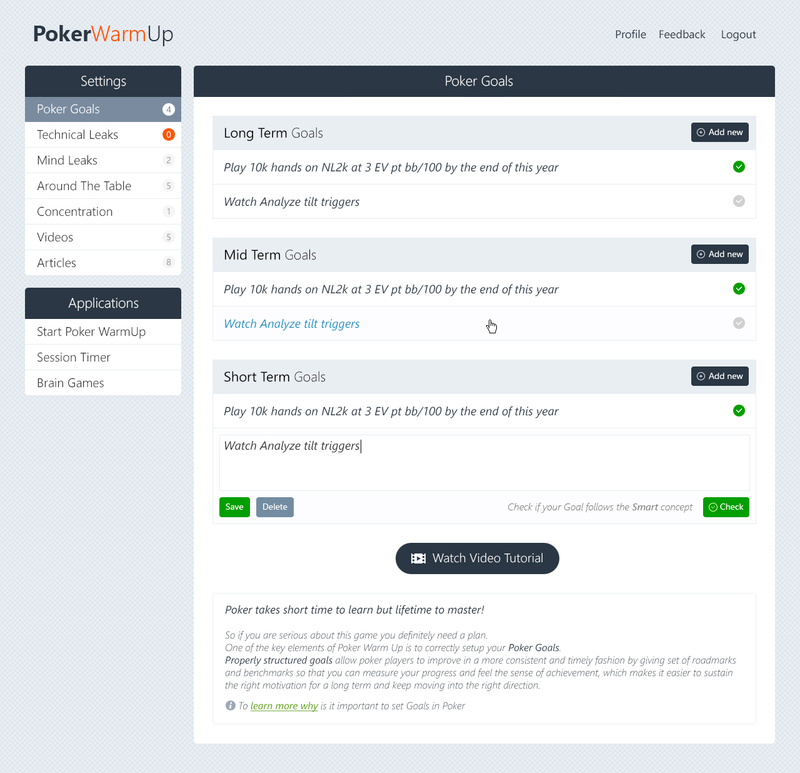 By adding the Poker Calculator and the Session Timer to your poker toolbox, you’re giving yourself the chance to grow as a poker player, as well as a way to increase your bankroll. If you’re serious about sharpening your edge in poker, you need to take advantage of every opportunity out there to improve your game. Make your goals public with new feature “Share on Facebook”! 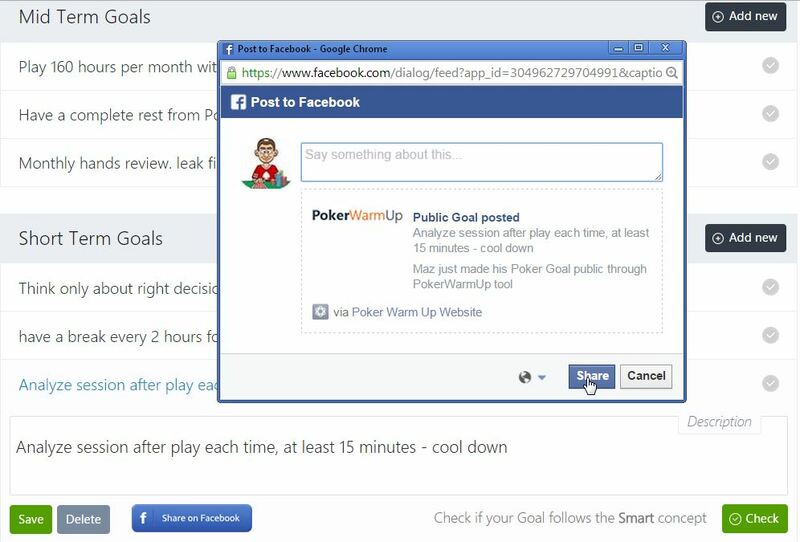 New feature allows Poker Warm Up users to post a Poker Goal or Leak on their Facebook page, as an additional source of motivation and support from friends and community. Will be sending newsletter every now and then mostly notifying of new features, updates, articles, feeback, etc. Will be adding all new registrations to the list and then later users can OPT out by clicking on unsubscribe link in one of those e-mails. Major website redesign and several new features gonna be added in the next couple weeks. We probably should change the order of steps during the Poker warm up. As per Jared’s suggestions in his article, the “Around the Table” step should run before anything else. And this is quite logical, we want to remove any distracting factors first, so that they can not even distract us from the Warm Up procedure itself. But I would like to hear some feedback first though, as I am using this routine myself for many months already, and the process of closing my skype, gmail , etc as the last step, gives me some extra motivational push and sense of accomplishment just before starting the session. Also sometimes I send some “last” messages in skype or gmail during warm up – to clean my head off of them.